a $499 32-incher with DVR built-in isn’t too bad and if you’re hard up for cash you can save a little money by sticking getting a TV and DVR in one. Speaking of pricing, I’m happy to say the rumors were wrong. The 32″ set runs $500 and the 42″ clocks in at $700. Which is much more reasonable for a Best Buy house brand like Insignia and allows them to compete with the likes of Vizio. Although, I suspect their intended market exceeds budget offerings. And it surely seems as they’ve invested a lot into this new platform. Best Buy has been keeping up with our comments and wants folks to know these are high quality 1080p, 120Hz LED sets that provide solid audio and visuals… which they stand behind with a 2 year warranty. Beyond the hardware, Insignia’s product management team focused on ease of use and they’re quite proud of those element – including, their guided setup which walks users through a speedtest to set streaming expectations. Of course our regulars are quite interested in learning how TiVo fits into this. As previously mentioned, these HDTVs feature “TiVo Design” via a partnership that kicked off about a year ago. Best Buy is quite fond of the TiVo experience, calling it both “intuitive” and “best in class.” And the majority of the interface should look familiar to any TiVo Premiere owner. TiVo’s universal search and recommendation engines are included, along with a three hour EPG. But, with just over-the-air tuning capabilities, live programming options will obviously be limited – without adding a set-top box to mix. So existing TiVo Premiere owners may take a pass until multi-room viewing (MRV) capabilities are added. Certainly, I fall into that camp. But it’s something Best Buy tells me is being discussed. Also being discussed… DirecTV RVU capabilities. Satellite television without the set-top? Insane (!) in the best possible way. But let’s talk more about what these televisions do today. Of course apps drive the smart TV market. And TiVo staples like YouTube, Pandora, and a finally redesigned Netflix are present. Joining them are Best Buy properties Napster (music) and CinemaNow (video on demand). Beyond these, Best Buy has harnessed the entire Chumby platform to bring countless other widgets to the big screen. The Best Buy Insignia Connected TV remote is a mashup of a traditional slab and TiVo-specific buttonry… and features some pretty high end functionality. It’s universal, communicating with the television via RF and the Z-Wave protocol. Once programmed, without codes, via a big screen UI it will then optionally control your peripherals via IR. Think that’s cool? Best Buy tells me an app-based QWERTY keyboard is also in the works. The question I have: How large is the market specifically for “smart” televisions? It’s safe to assume folks refresh their TVs at a much slower rate than they might test the waters with a $60 Roku or $100 Apple TV. Also, given highly unpleasant experiences with a crashy Internet-connected Vizio television I’m unlikely to go down this path again. However… allow me to stream recordings from a TiVo Premiere to an Insignia television in another room, and I’m most definitely in – no further questions asked. How about you? Good to hear that they are in discussion, but this functionality should have been there day one if they want this thing to succeed, especially for existing Tivo owners. Does the Netflix app run as a Chumby add-on or was it actually developed by Tivo? FYI, the rumors weren’t exactly wrong… there are the two TV on Bestbuy.com this morning at the price points you had mentioned. And they don’t even mention TiVo in the description! nomo, expect updated Best Buy product pages and a landing page to launch later today. I knew my pricing intel was wrong as of late Thursday, but was told so in confidence and could only allude to it. Although I will say it was only wrong because Best Buy’s internal inventory system is wrong…. ;) I have amazing sources and have been known to engage in some tenacious Googling. It’s amazing how the more ‘proper’ tech blogging sites get simple stuff wrong. Hat tip to Dave Zatz! PS – Tech Crunch has published many articles with errors and when I contact them, they never seem to update or when they do, never documents correction for readers. Bad form. Well, LAN streaming is obviously on the way. But given that this paves the way for a future TiVo extender-only box (with no monthly fee), why go integrated, unless you just can’t wait? As always, keeping the inputs separated from the flat-panel is a customer’s best practice, unless you like throwing away money. I’m in for one if they add TiVo streaming to it. Dave – do you know if the hardware could support MRV? Or would it have to be a hardware refresh to get that? I am under the impression the hardware is capable. While Insignia product management tells me there’s “more to come” and they’re “discussing” it internally and with TiVo, I personally suspect (and hope) it’s on the road map. But who knows… until it arrives, it doesn’t count. The “DVR Not Included” is a dead giveaway that it’s on the road map. You wouldn’t write that text that way if it weren’t. But, of course, with TiVo, there is often significant lag between the map and the territory. Premiere to Premiere streaming isn’t here yet either. Add streaming from premiere boxes and I’m in for atleast one, maybe two. Certainly one for the workout room and maybe one for the bedroom. No it just means that Best Buy is trying to avoid misrepresenting the product as something it is not. I understand it can be literally read as meaning nothing more than that. I’m just saying that that specific phrasing is a dead giveaway that DVR LAN streaming is on the road map. If it weren’t, the phrasing would be different. Dave – can you comment on the Netflix app you have in front of you? 1) Is it Chumby-operated or native? 2) Does it support subtitles / other missing features? Browsing experience? Anything else? The Tivo Premiere’s Netflix implementation is the worst of any device out there – I guess I’m desperate for some sign, ANY sign, of possible improvement. Thanks! I have two screengrabs, one linked within the article. As I alluded to in comment 3, I’m seeking clarification and approval to cover in greater depth. I believe I’m in the minority, but I have zero interest in TVs with integrated streaming features. Why? Because I keep a TV for about 10 years, while the streaming features change much faster than that. Now that HDMI switching is easy and cheap, who cares if you have several boxes. So with the new pricing, the premium for these “smart TV” features is effectively zero, which I feel is probably about right. These features will become ubiquitous in the next couple of years. If it supported streaming MRV from a connected DVR on the network, this device would really be something special. As is, it’s a fine choice at the low end competing with the Vizios of the world. The TiVo UI design has always been fantastic, so yay for that. Hopefully Best Buy licensed the look & feel and didn’t actually take any code from TiVo. I’m a huge TiVo fan, but I just see this causing nothing but problems for Best Buy right now. Consumers already use the TiVo name as a verb for recording shows via any DVR. Good luck explaining that this won’t record to the average Joe. Having said that, I will consider one as soon as the multi-room viewing is enabled. Dave, I noticed in one of the pics that the TV includes a USB port. Any idea whether the TiVo Slide Remote will be supported? Sure. If you want to assume it’ll stay current with the TiVo platform for 5 years and if you want to assume you’ll still be on the TiVo platform in 5 years, and you want to assume the TV only has a 5 year lifespan, go for it! But, IMHO, it’s still best-practices from the consumer POV to keep the inputs separated from the flat-panels. You know HDMI and 1080 are still going to be the standards 5 years out. You have no idea what the input landscape is going to be just a few years out. Buying integrated ends up sticking you with a pretty whomping “convenience fee” on top of the electronics. 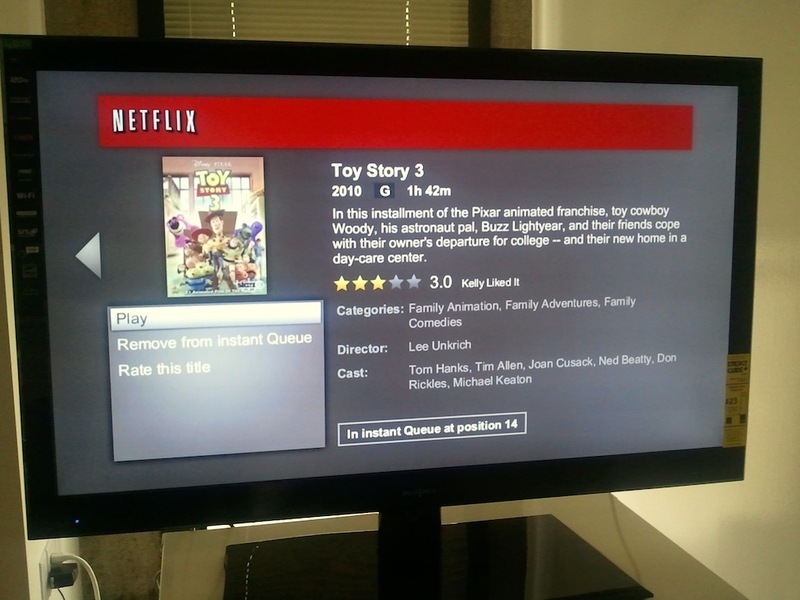 If you’re willing to pay the fee, this TV is for you. It means: TiVo LAN streaming will work with this TV, but we’re not ready to implement that feature. Sam, I’ve been informed all TiVo remotes are compatible with these sets – including the TiVo Slide. Chucky, I’d pay that convenience fee to minimize my clutter/footprint (in regards to a tertiary TV). Dave, Great news on the slide remote compatibility. Hope I’m not the only one excited about the prospects of using this as a tertiary TV! If it can stream from a Tivo and if DLNA gets enabled sign me up for a couple. Easier to stream music, pictures, and recordings. The TiVo Blog entry gives great hope, if not outright confirmation, for Premiere streaming. Hopefully TiVo delivers. Best Buy’s website still isn’t up to full speed on the new units. The 32″ is listed @ $599, not $499 and the 42″ unit is listed @ $999, not $699. I dunno. I think that is a pretty ambiguous statement and you can read anything you want into it. One reading of it could mean: if you have a TiVo and you plug it into the Insignia, you will be able to watch it. Your reading may well be correct. Agree with Chucky. Don’t much care about the internet streaming features built into my TVs. They will be outdated quickly. An outboard Tivo streamer would be a better fit for me. I won’t be buying one of these Insignia TVs whether they eventually support Tivo streaming or not. For those who think this is an important feature… I think you’re forgetting how rare Tivo owners are these days. Not sure that Best Buy would really sell that many more TVs even if they had that feature. All that said, this is still interesting because of how it predicts stuff we might see in upcoming updates to the Tivo non-Insignia product line. Which I *do* care about. Yup. We’ve crossed the no-monthly fee line for extender-only boxes, for one. The pause button Dave? How can you show us a pic of the remote with a pause button and not let us know if that works on the TV or expects a TiVo DVR being controlled as well? and yes more on the Netflix interface, that has been a significant sore spot on TiVo DVRs. Josh, we know it does not today. But Best Buy and TiVo are discussing streaming as a possible future feature. In regards to platform, I wouldn’t expect the S3/THD to ever stream (rather than copy) between TiVo spokes. Right, I merely included the mention of S3 because that’s how the original questioner (to whom Margaret was responding) posed the query. I’m well aware that when/if streaming arrives to the official TiVo OS, it’ll be from Premieres only. One hopes that such “streaming” will also someday mean TiVo Premieres will also lose the redheaded-stepchild asterisk and be able to stream Amazon Prime Instant content too… but that’s a whole ‘nother discussion entirely. That being said… I would only recommending buying this Insignia set based on what it offers today. I wouldn’t gamble on this purchase based on any “soft confirmation” of any discussions anyone’s heard about with regards to future features. Personally, I’ve had enough experience with TiVo products to know that the wait for “possibilities” in the future is maddening and often fruitless.